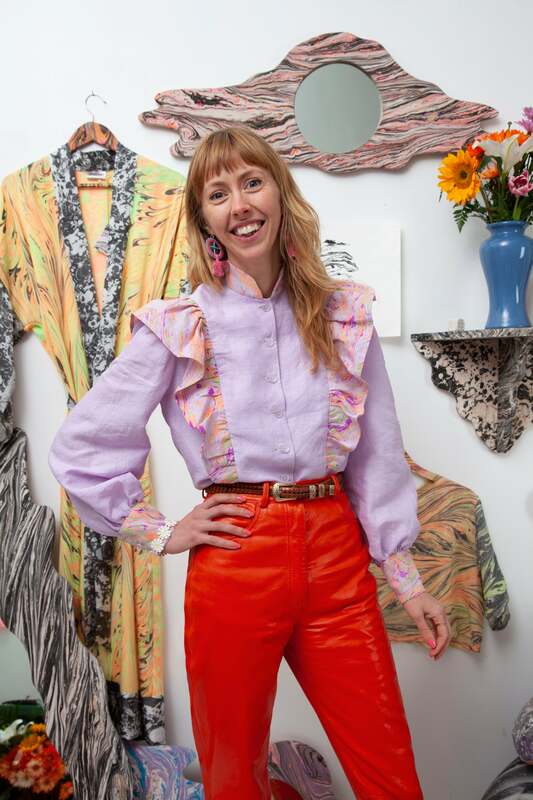 For artist Maeve “Maisie” Broome, every single surface is worthy of a psychedelic marbling treatment, whether that’s a piece of driftwood, a feather, a custom-made outfit, or a throw pillow. Born and raised in Maine, the creative has been experimenting with marbling for nearly 10 years, turning all kinds of everyday objects into original, dreamy pieces for the home and the body. With a background in sculpture and two-dimensional design, Broome is the founder of Myfawnwy, a multidisciplinary design studio through which she releases one-off pieces that update old marbling techniques that have been around for centuries. The 33-year-old, who currently resides and works in Ridgewood, Queens, is drawn to the ways in which the medium doesn’t allow her to exert too much control over the outcome. “Marbling lets me play with illusion and experiment with fluidity,” she says. It’s through this conceptual exploration that Broome aims to create a complete environment in which all her different work can live where there is no distinction between design and art. Much of Broome’s creative inspiration is drawn from patterns found in nature—from light shining through leaves to the spontaneous patterns we see when we close our eyes, the artist finds the relationship between the interior and exterior landscape deeply fascinating. In her artistic practice, Broome borrows from the Turkish Ebru technique, which dates back to the 15th century. She tests the limits of the technique through experimentation with psychedelic patterns, capturing saturated and crisp patterns with the help of water and heavy pigmentation. To create her pieces, Broome starts by preparing her object (anything from clothing to twigs) and soaks them in a solution of aluminum sulfate water, a mordant that opens up the fibers so the ink can adhere to the surface. While the materials dry, she mixes up a marbling bath, building up color and pattern that is then manipulated into the design of her choice. Next, she lowers an object onto the surface, letting it rest on the bath, where it instantly absorbs the design. While the marbling process is physically active, time-consuming, and messy, the artist still enjoys the process because it allows her to have fun. Broome notes that her work challenges her not to take her work or herself too seriously. “I am constantly exploring and pushing this medium forward to see what potential it holds, and it is a surreal and captivating process,” she says. After spending years working overtime to fill large store orders, Broome now makes a conscious effort to create in her own time, which she says allows for more free-flowing creativity. Broome prints on different surfaces and materials, such as found objects and on wooden shapes that she cuts out and assembles to make mirrors, puzzles, and design objects. She also explores scale by printing on large pieces of silk, linen, and cotton, in addition to sewing custom clothing and soft home goods such as pillows, tablecloths, and curtains. While she’s been making the clothing and soft pieces for some time now, which have been sold at Rising States in New York and Candid Home in Los Angeles, she’s currently looking into factories to work within near where she grew up in Maine to take this element of her practice to the next level in a way that is thoughtful and impactful to the local community. Broome’s wooden pieces, which include abstract mirrors, shapes that resemble mountains, and two-piece puzzle structures of faces, were made in December and have already garnered a highly positive reception. Currently, she’s also in the process of introducing text into her prints by controlling the ink as a means to spell out specific words—a new kind of tie-dye of sorts. “It resembles Scooby Doo,” she jokes about the fluid ’60s-style font during our studio visit. In the future, she also sees this is as an opportunity to collaborate with poet friends. For Broome, art remains a space where she can just let loose, slow life down in a necessary way, and allow her creativity to subconsciously percolate, always on its own timeline.